NIFTY SUPPORT AT 4961 – 11/06/2010. To say that the market was very volatile last week would be an understatement. The market started the week on a weak note as it went below the 200dma. But as some stability returned to European and Chinese market, our market too rebounded and regained the 200dma and closed above that on Thursday. 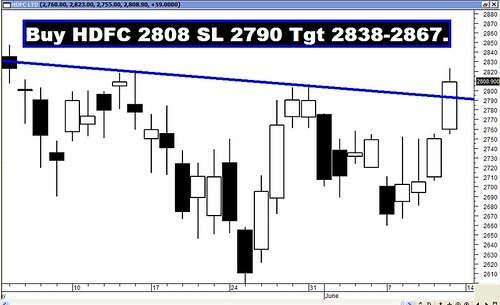 The breach of the 200dma initially and the subsequent regaining of the 200dma, proved that it was a Bear trap. The bears had to run to cover their shorts as the market gained in strength on the back of short covering as it even managed to close the week above the 100dma. When the Nifty breached the 200dma, it bounced back from 4967 which is just above the support level of 4961. Hence the support at 4961 is very critical for the short term uptrend to stay alive. The IIP numbers maintained its double digit growth rate for sixth month in a row when in April it posted a strong growth of 17.6% backed by strong growth in Manufacturing and Mining sector particularly Capital Goods. The market was in for a pleasant surprise when the IIP figure for April came in at 17.6% as compared to 1.1% last year. The IIP figure was helped by Manufacturing which grew at 19.4% as compared to 0.7% a year ago. Mining also grew stronger at 11.4% as compared with 3.4% last year. The surprise packet was the Capital Goods which posted a robust growth of 72.8% as compared to -5.9% last year. This reinforces the belief that despite partial removal of relief package by the RBI, the economy remains on a strong growth trajectory. The Sensex opened the week at 17069, made a high of 17131, a low of 16560 and closed the week at 17064. The Sensex lost around 53 points on a weekly basis. Similarly Nifty opened the week at 5132, made a high of 5139, a low of 4967 and closed the week at 5119. The Nifty too closed with the week with a minor loss of 16 points. On the weekly charts Sensex has formed a Paper Umbrella formation with a long lower shadow, suggestive of the buying which emerged at lower levels. On the Nifty it almost formed a Dragonfly Doji but with a slight upper shadow. The long lower shadow is indicative of the buying pressure at lower levels. On the daily charts while the Nifty has formed a bullish white candle, the Sensex has formed a small white body star formation which is a neutral formation. The ROC and MACD continue with their Buy signals even though MACD is in negative territory. RSI which is at 53 has signaled a Buy and so has the Stochastic Oscillator which has just moved from the oversold zone and signaled a Buy. OBV and the MFI too have signaled a Buy. Only the Directional Indicators continue in their Sell mode but the –DI is now converging towards the +DI which is positive if it continues. Sensex has a strong resistance zone between 17150 – 17250 as the previous weeks high which is also an intermittent top falls at 17150, followed by the 50dma (17176) and finally the 61.8% retracement level of the current fall (17250). Similarly the Nifty too has a resistance zone between 5147 - 5165 as the previous intermittent top falls at 5147, followed by 50dma (5149) and then the 61.8% retracement level of the current fall (5165). When the Sensex closes above the resistance zone of 17150 - 17250, it will complete a Bullish Inverted Head & Shoulder pattern and the target for that will be 17650-18483, provided that Sensex stays above 16550. Similarly when Nifty closes above the resistance zone of 5147 – 5165, it will also complete a Bullish Inverted Head & Shoulders pattern and the target for that will be 5301-5548, provided that the Nifty does not breach the 4966 level. If the Nifty breaches the support of 4961, then one can assume that the correction of the larger time frame is still on. So we will be looking at the correction of Sensex rise from 13219 to 18047 and the correction levels will be 16203-15633-15063. Similarly one has to consider the Nifty rise from 3918 to 5399 and for that the correction levels will be 4833-4659-4484. Nifty OI PCR is quite heavy 1.66 suggesting that the market is more on the bullish side. Strong Put writing is seen at the strikes of 5000 and 4800, which should act as strong supports in case of a downfall. Call writing is seen at 5200 strike which should act as a resistance. Sensex has strong Trendline resistance at 17344 and Support at 16790. Nifty has strong Trendline resistance at 5170 and Support at 5041. For the week ahead, Sensex will find Support at 16845-16635-16373 and will find Resistance at 17198-17344-17493. For the week ahead, Nifty will find Support at 5051-4984-4908 and will find Resistance at 5160-5212-5269. Last week was a bumper week as all the recommended stocks reached their targets with ease.